NYFW & Fall Classic NYC. 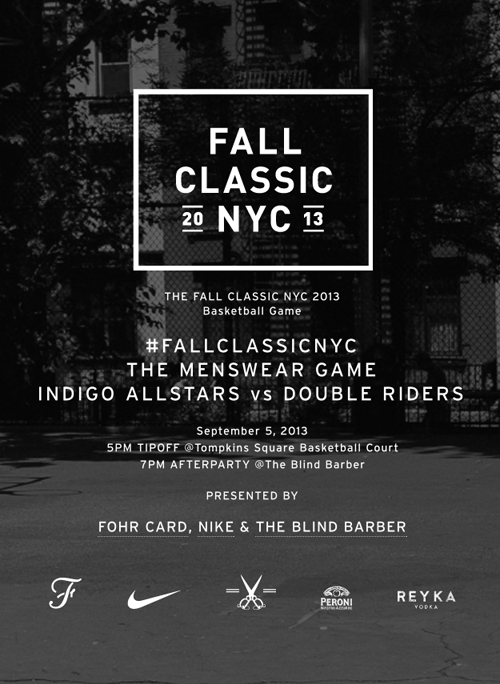 Extremely excited to be working with Alex Maier in conjunction with Fohr Card x Blind Barber and Nike, filming the FALL CLASSIC NYC 2013 Basketball Game. The tip off takes place Thursday, September 5th at 5pm in Tompkins Square BBall court. Afterwards we'll be enjoying cocktails and keep the party going at Blind Barber. It should be a great way to kick off #NYFW in proper NY style. I'm looking forward to bringing the A-game at my very first NYFW; shooting both video and photo's as much as possible, meeting as many industry professionals- saying yes wherever I can and no, only when I've had too many... However, you can count on plenty of content while I'm on the move the whole week. I'll be updating my other blog memoryoradream.tumblr.com with content sporting the hashtag #NYFW #MBFW or #NYFW13. Keep an eye out.